Every March, top lawmakers and political advisors gather in the capital from all over the country to attend the "lianghui," or "two meetings" where they review the performance of the government over the past year and hear new policies and major economic targets. 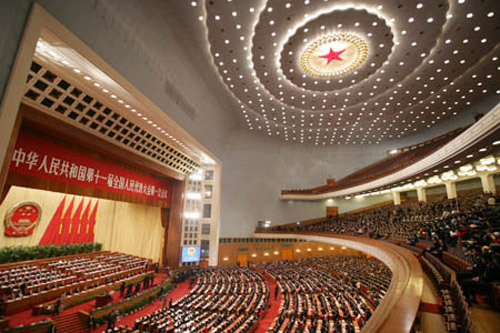 The two parts of the "lianghui" are the National People's Congress (NPC), which is the country's top legislature, and the Chinese People's Political Consultative Conference (CPPCC), a body that advises the government on a range of issues. The meetings typically last about 10 days. Premier Li Keqiang delivers a report on the government's work to the 3,000 delegates on the first day of the NPC conclave, which this year begins March 5. His press conference on the final day (March 15) is also closely watched because he fields questions from foreign journalists. The report Li delivers will announce China's targeted GDP growth for the year and other key figures, such as the national defense budget. Compared to the Communist Party's big meetings, the "lianghui" is more visible, perhaps intended to provide the public with a bit of political theater. Technically it is the highest organ of state power. Its roughly 3,000 delegates meet once a year to ratify or approve policies, laws, the budget and top government personnel changes, which are mostly placed before it by other official organs. A 175-member NPC Standing Committee runs the legislature and passes laws between the annual meetings. It is chaired by Zhang Dejiang, No. 3 in the Communist Party after Xi Jinping and Li. Has the NPC ever rejected legislation? It has never voted down a proposed law, which has raised questions as to its function. However, since the legislature held its first meeting in 1954, there have been increasing instances of a lack of consensus. In 1982, three delegates abstained from a vote for the first time. The first "no" vote was cast six year later when Taiwan delegate Huang Shunxing voted against a nomination for chairman of the NPC's Education, Science, Culture and Public Health Committee. Then in 1992, only two-thirds of the legislature voted for the Three Gorges Dam project. More recently, hundreds of delegates have voted against or abstained from voting on the work reports given by the head of top prosecutor's office and the chief judge of the Supreme People's Court. Who can be an NPC member? Delegates are elected to five-year terms mostly by provincial people's congresses, who themselves are elected by lower-level assemblies. Only delegates at the lowest level – the county level or equivalent – are directly elected by the public. The People's Liberation Army also picks some members. The NPC has 2,943 members this year, meaning each one represents about 670,000 people. Some 406 delegates represent China's 55 ethnic minorities. Then what does the CPPCC do? The CPPCC is a collection of advisors that give party and government bodies suggestions on economic, political, cultural and societal issues. The membership is more varied than the NPC, and not everyone is a party member. Many CPPCC members are leading figures in fields such as academics, the legal profession and the business world. The body also has some star power, with luminaries like former NBA star Yao Ming and Hong Kong actor Jackie Chan holding posts. China’s cold chain logistics industry, which now enjoys special status under the Chinese government’s macro economic control policy, will continue to strengthen and improve, while maintaining rapid operational growth. The industry was chosen as a favored industry because of its importance in maintaining public health and food security. At the same time, disposable incomes in China are rising, and food safety is becoming more of a concern for individual consumers. According to recent studies conducted by the International Cold Storage Association, only 15% of products requiring temperature control were handled correctly in China, and only 10% of vehicles that are used for perishable products are equipped with cold storage equipment, not just ice cubes or ice bricks. Most of the logistics systems do not have any temperature control at all. As a result, more than 30% of the agricultural products produced in China are wasted during transportation. Due to lack of proper handling, product quality of the remaining 70% is in question. Food safety is becoming more of a concern for consumers and a complete system for cold chain logistics is in demand. In 2015, meat production in China exceeded 80 million tons, vegetable 700 million tons, fruit 260 million tons, dairy products 27 million tons and seafood 60 million tons. Besides, large amounts of meat and frozen food are produced every year in China too. Temperature fluctuation in cold storage and transport is one of the main reasons for food quality decline. To ensure those perishable foods' freshness and quality, cold chain logistics is needed. At the end of 2014, China had a freezer capacity of about 120 million cubic meters and less than 60, 00 refrigerator vehicles, lagging far behind developed countries in per capital terms. As a high-end sub-industry of logistics, cold chain logistics will become the focus of many investors in the next few years. As e-business develops in China, e-business enterprises operating fresh food are springing up and the supporting cold chain infrastructure. 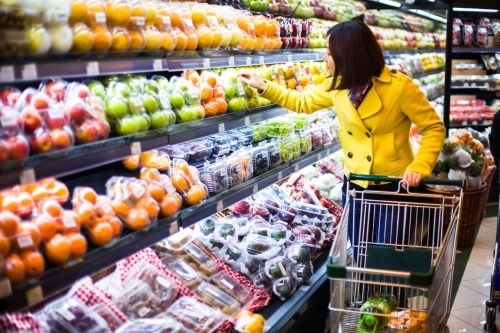 Many e-business companies in China have got into the field of fresh food, for example, large e-business enterprises like Tmall and JD have published their own fresh food strategy. Besides, logistics enterprises like SF Best of SF Express are conducting e-business and a bunch of professional fresh food e-business enterprises like Too Too Organic Farm are developing fast too. According to CRI's estimation, the market size of fresh food e-business was about CNY 100-120 billion and CAGR during the period of 2016-2020 will exceed 50%. Currently fresh food e-busines companies hardly invest in cold chain equipment but they indirectly force the construction of cold chain distribution networks. Enterprises such as JD and Tmall are still weak in cold chain warehouse, logistics delivery system and door to door delivery where they mainly cooperate with a third party cold chain logistics companies. The cold chain logistics network can be divided into two parts: cold chain home delivery and cold chain artery, the former belonging to express and less-than-carload logistics while the latter involving supply chain management and third party logistics. Cold chain logistics is a sub-industry of logistics, with the largest potential market despite its complex operation and high barrier to entry. Cold chain logistics will be one of the fastes growing sub-industries of logistics in China in the next few years. With sustained consumer growth, a fast increase in demand for food, drugs and cosmetics: the cold chain logistics industry in China will undergo a transformation enableling investment opportunities in China for cold chain equipment manufacturers and cold chain logistics enterprises. 47 qualified companies currently vie in the competition for refrigerated trucks. Among the top players including CIMC (Shandong), Zhengzhou Hongyu, Henan Bingxiong, Henan Frestec, Zhenjiang Speed Auto and KF Mobile, CIMC (Shandong) occupies the Shandong market, and seizes market share in Guangdong, Zhejiang, Hubei and other places; Henan Bingxiong performs outstandingly in Northeast China, Shanxi and Inner Mongolia; Zhenjiang Speed Auto and KF Mobile focus on East China and dominate the East refrigerated truck market. Zhengzhou Hongyu not only takes a favorable position via giants such as Shuanghui, Yurun, Topin, Sanquan and Synear in Henan, but also makes some achievements in Beijing, Hebei, Ningxia, Jiangsu and other markets. CPC Central Committee's Proposal on Formulating the Thirteenth Five-year Plan on National Economic and Social Development - sets out the goals, principles and targets for China’s development in the next five years, and will have significant business implications, not only for China, but also for the world, given the size and global influence of China’s economy. Becoming the world’s second largest economy, the largest trading nation, the largest destination for foreign direct investment and the third largest global investor, together with the largest foreign exchange reserves. Achieving average GDP growth of 7.8% over the past five years, 48.1% of which was contributed by the services sector of the GDP, exceeding manufacturing and construction. Reaching an urbanisation rate of 55%, lifting over 100 million people have out of poverty in the past five years. government over-regulation and poor quality services. China’s economic growth has slowed down to 6.9% in the first three quarters of 2015. In the words of CPC leadership, China’s economic growth model is “unbalanced, uncoordinated and unsustainable”, and must be changed. The 13th FYP is the first five-year plan formulated under President Xi Jinping's leadership and considered strategically important as the year 2020 will be the centennial anniversary of the founding of the CPC and the deadline for realising China's goal of becoming "a moderately prosperous society in all respects". In other words, China needs to double its 2010 GDP and per capita income of both urban and rural residents by 2020 – an enormous task given the current economic uncertainties. strenuously promote environmental protection and low carbon growth. President Xi Jinping later elaborated that, to achieve the goal, China would need to maintain an average annual GDP growth rate of 6.5% until 2020. This growth rate, coupled with a smooth transition to a growth model primarily driven by consumption and services, will hopefully guide the economy into its “new normal” period and help China avoid the “middle-income trap”. The CPC proposed the following specific action points and targets for each aspect of the 13th FYP. In declaring China’s future development “must rest on the basis of innovation”, the CPC has made clear the strategic importance of innovation in the 13th FYP. Build a ubiquitous and fast mobile information network to balance improvements to the transportation and mail delivery networks. Manufacturing remains the keystone of China’s economic growth and the basis for building an innovation-driven nation as well as for overseas expansion. Establish a green development fund to promote clean production through clean energy, green transportation, control of carbon emissions in major industries and a circular economy. Push for pilot projects on Near Zero Emission Zones. Control and reduce agricultural pollution. Ban commercial logging of natural forest and improve forest growing stock. The country will also strengthen protection of endangered species through breeding centres and gene banks, while improving management and control of wildlife imports and exports including ivory. As stipulated in the new environmental law, the 13th FYP reconfirms that government officials will be audited upon leaving their posts on the balance sheets of natural resources. Construct energy storage and smart grid and develop distributed power. Raise the energy conservation standards for buildings and promote green building and green building materials. Boost low-carbon public transportation with an improved rail transport system. Promote cycling and new energy vehicles to encourage a "green" and sustainable lifestyle. In line with its international commitments; According to official statistics, China is planning to invest US$6.6 trillion in the coming decade on low carbon technology, renewables, energy efficiency and emission reduction products, generating huge business opportunities for Chinese and foreign companies along the way. Improve SOE vitality, controlling power, influence and resilience. Strengthen its supervision over state assets by shifting its focus to capital management. Encourage more state capital to be invested into the sectors and industries that are of significance to national security and the national economy. Reduce government intervention in the operation of enterprises, reduce administrative approvals, break regional market segmentation and sectoral monopolies and create a fair competitive environment for all enterprises. China is still at the early stage of urbanisation. The CPC anticipates over 100 million of farmers will become city dwellers, generating a market of US$6 trillion relating to their settlements and employment in the next five years. Coordinate regional development to achieve balanced growth, by improving infrastructure development in the western region while rejuvenating the north-eastern industrial hub and facilitating the rise of the central region. Enhance support to less developed regions, such as ethnic minority communities and border areas as well as resource-strained and ecologically degraded regions, and help shift excess industrial capacity from the affluent coastal cities to developing western regions. Support the development of a series of city clusters across the country. Call for proper and green city planning and industrial layout designs, and integrated growth of urban and rural areas. Support the enhanced connectivity of inter-city transport and communications as well as the development of green cities, smart cities and forest cities. Further reform the household registration systems (hukou system) to enable rural families to settle in cities and enjoy equal rights and the same treatment as city dwellers. Draw up plans to open up the competitive businesses of power, banking, transport, telecommunications, oil and gas and public utilities. Adopt a two-child policy so as to promote the balanced development of the Chinese population. It is estimated that under this new policy, 6 million more babies will be born each year, generating an infant-related goods and services consumption market worth US$16 billion. Gradually postpone the statutory retirement age. Make elderly care services a fully open market. Encourage the private sector to invest and provide diversified education services. Adjust the country’s income distribution system and narrow the income gap so as to "significantly" increase the wages of the low-income population, and increase the proportion of middle-income group. Promote the mechanism of collective negotiations for wages and further increase the minimum wage levels. Take a more positive approach by launching a free professional skills enhancement programme for the peasant workers and people from unprivileged backgrounds. Remove barriers and restrictions for employment, and encourage more people to start their own businesses. China has made remarkable progress in poverty relief. It was the first developing country to meet the Millennium Development Goals (MDGs) target of reducing the population living in poverty by half ahead of the 2015 deadline. Despite this, China still has 70 million people in the countryside living below the country's poverty line of 2,300 yuan (US$376) annual income by 2010 price standards. A distinctive feature of the 13th FYP is that it’s the first five-year plan that shifts from the traditionally domestic focus to a much wider international perspectives by including more cross-border issues, in line with China’s rising position in today’s global economy. Promote the development of local industrial capabilities. Collaborate with international financial institutions, such as the Asian Infrastructure Investment Bank, the New Development Bank, together with China’s Silk Road Fund, to attract worldwide financial support. Actively participate in the UN climate change negotiations and cut its emissions. Expand the scale of foreign aid to developing countries and contribute to the 2030 Agenda for Sustainable Development. These statements and plans, while demonstrating China’s commitments as a responsible player of the international community, reflect China’s confidence as a world power and its rising global perspectives and aspirations. Fully implement a pre-establishment national treatment to foreign investors. Support will be given to coastal areas to participate in global economic cooperation. Establish advanced manufacturing bases and economic zones, and continue to improve border and cross-border economic cooperation zones. Encourage Chinese companies to invest overseas and sell more Chinese equipment, technology, standards and services to foreign countries. Encourage Chinese companies to further their cooperation with foreign peers to improve their equipment manufacturing capabilities, added value and technological competitiveness. Further integrate into the world’s supply chains and value chains through establishing overseas production bases and financial services platforms. Transform the banking system into a multi-level and diverse system, and provide more financial support to small and micro-sized businesses and rural regions and impoverished areas. Relax restrictions and allow more private entities to establish banks. Provide strong support to green finance, including the issuance of green bonds. In October, the Agricultural Bank of China issued its landmark listing of Renminbi and dollar-denominated green bonds with a total value of $1billion at the London Stock Exchange. The issue was four times oversubscribed. Establish a standard financing mechanism for local governments. Continue to press ahead with capital account liberalisation and the internationalisation of the Renminbi, which is already the world’s second currency for global trade finance and became the fourth most-used world payment currency in August 2015. Actively push for wider international support for the inclusion of the Renminbi in the IMF Special Drawing Right (SDR) basket. Increase the exposure and wide usage of the currency in international markets. The government has vowed to promote the administration of rule of law, innovate its ways of macroeconomic control and social governance, and continue to fight corruption. Cement achievements made in the anti-corruption campaign and tighten supervision and checks over power, in addition to working out an effective mechanism to stem corruption. According to China’s political process, the CPC is responsible for formulating a proposal document that maps out the goals, principle and targets for the next five-year plan. The State Council will then add flesh to the bones and work out a more detailed outline, which will then be submitted to the top legislature – the National People’s Congress - for review and ratification in March 2016. Following that, each province and central government ministry will accordingly formulate its own five year plan and be responsible for implementations. 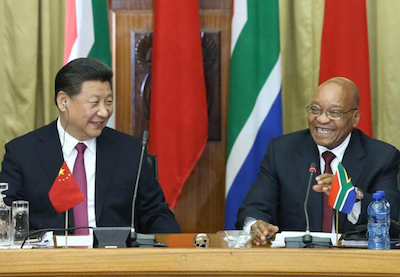 The Johannesburg Summit and the 6th Ministerial Conference of the Forum on China-Africa Cooperation (FOCAC) were held in Johannesburg from 3 to 5 December 2015. Heads of State and Government, Heads of Delegation, the Chairperson of the African Union (AU) Commission and Ministers of Foreign Affairs and Ministers in charge of economic cooperation from China and 50 African countries (hereafter referred to as "the two sides") attended the Summit and Ministerial Conference respectively. The two sides reviewed with satisfaction the development of relations between China and Africa and applauded the positive contribution FOCAC had made over the past 15 years since its inception in advancing the comprehensive and in-depth development of China-Africa relations, and agreed that FOCAC had become both a key platform for collective dialogue between China and African countries, and an effective mechanism for practical cooperation. The two sides share the view that, as China works for the Two Centenary Goals and as Africa implements Agenda 2063 and its First 10-Year Implementation Plan, the current development strategies of China and Africa are highly compatible. The two sides shall make full use of their comparative advantages to transform and upgrade mutually beneficial cooperation focusing on better quality and higher efficiency to ensure the common prosperity of our peoples. The two sides are satisfied with the effective implementation of the Forum on China-Africa Cooperation Beijing Action Plan (2013-2015) adopted at the 5th Ministerial Conference of FOCAC, and decide, in the spirit of the Johannesburg Declaration of the Summit of the Forum on China-Africa Cooperation, to jointly establish and develop comprehensive strategic and cooperative partnership between China and Africa featuring political equality and mutual trust, economic cooperation for win-win results, exchanges and mutual learning between Chinese and African civilizations, mutual assistance in security affairs, as well as solidarity and cooperation in international affairs. In order to implement the outcomes of the Summit and the Conference, and chart the course of China-Africa friendly and mutually beneficial cooperation in all fields in the next three years under the theme of "China-Africa Progressing Together: Win-Win Cooperation for Common Development", the two sides jointly formulate and adopt with consensus this Action Plan. The two sides will continue to encourage high-level mutual visits and dialogue in order to consolidate traditional friendship, enhance political mutual trust and deepen strategic consensus and coordination. 2.2.1 So as to enhance the planning and implementation of relations and cooperation between China and African countries, the two sides agree to improve and encourage mechanisms such as bilateral joint commissions, strategic dialogues, foreign ministries' political consultations, and joint/mixed commissions on economic and trade cooperation. 2.3.1 The two sides will enhance exchanges and cooperation between the National People's Congress of China and African national parliaments, regional parliaments, the Pan-African Parliament and the African Parliamentary Union, to consolidate the traditional China-Africa friendship and promote mutually beneficial cooperation. 2.3.2 The two sides will expand and enhance exchanges and cooperation between the Chinese People's Political Consultative Conference and African national parliaments, regional parliaments, the Pan-African Parliament and the African Parliamentary Union. 2.3.3 The two sides will deepen exchanges between the China Economic and Social Council, the AU Economic, Social and Cultural Committee, and the economic and social councils and other relevant institutions in African countries. 2.3.4 The two sides will increase the frequency of high-level contacts between political parties, enhance cooperation on personnel training, deepen bilateral and multilateral political dialogues, and increase experience sharing on governance and national development. 2.3.5 The two sides will promote exchanges and cooperation between local governments, and support the establishment of more sister provinces/cities relationships, as well as the institutionalization of the China-Africa Forum on Cooperation between Local Governments. 2.4.1 The two sides recognize the important role of the African Union in safeguarding peace and stability in Africa, promoting the development of Africa, and advancing the integration process of Africa. The two sides, furthermore, acknowledge with appreciation the efforts and contributions made by China to support Africa's peaceful and stable development and integration. 2.4.2 The two sides appreciate the comprehensive development of relations between China, sub-regional and pan-african organizations and the African Union, agree to maintain the momentum of high-level exchanges, continue to improve the strategic dialogue mechanism, and enhance strategic mutual trust and practical cooperation. 2.4.3 China appreciates the adoption of Agenda 2063 and its First 10-Year Implementation Plan by the African Union, and will continue to support the African Union in its efforts to build a united, integrated and prosperous Africa that is at peace with itself and the world. 2.4.4 The Chinese side appreciates the positive role of the African Union Commission since it became a member of the FOCAC, and will also continue to strengthen cooperation with and support for the New Partnership for Africa's Development (NEPAD). 2.4.5 The two sides agree to actively implement the Memorandum of Understanding on the Promotion of China-Africa Cooperation in the Fields of Railway, Highway, Regional Aviation Networks and Industrialization, making good use of existing cooperation mechanisms such as the Joint Working Group of Transnational and Trans-regional Infrastructure Cooperation in Africa, and to promote practical cooperation between China and the African Union in priority fields. 2.4.6 The African Union appreciates the establishment of the Mission of China to the AU in Addis Ababa, Ethiopia. China invites the African Union to establish a representative office in Beijing at an early date. 2.4.7 The Chinese side will further support the capacity building of the African Union and sub-regional organizations in Africa in various forms, such as through human resources development. 2.4.8 The Chinese side will establish and improve mechanisms of economic and trade cooperation with regional and sub-regional organizations in Africa, enhance economic and trade cooperation between China and Africa at regional and multilateral levels. The Chinese side welcomes and supports African initiatives regarding the creation of free trade zones and will study the possibility of establishing free trade zone cooperation. 3.1.1 The two sides agree that realizing agriculture modernization in Africa by strengthening China-Africa agricultural cooperation is an important way to contribute to food security in Africa, and should be given priority in the context of China-Africa cooperation projects. The cooperation will enhance agricultural transformation and upgrading, increase agricultural production, processing and income, and safeguard food security in Africa bearing in mind the prevailing regulatory requirements. 3.1.2 The two sides will continue to strengthen cooperation in the fields of agricultural policy consultation, planning and design, and support the implementation of the Comprehensive African Agriculture Development Programme (CAADP) through assisting to build agriculture technology demonstration centres, sending professionals for technical cooperation, and training agricultural technicians. In this regard, the African side appreciates the support already rendered by the Chinese government for African countries to implement the CAADP. 3.1.3 The Chinese side will carry out agricultural demonstration projects in Africa, build or upgrade agricultural technology demonstration centres, make effective use of such centres focusing on agricultural research, demonstration and training, expanding training, transferring breeding and plantation technologies and cooperate with African countries to increase agricultural unit productivity. 3.1.4 The Chinese side will continue to send 30 teams of senior agriculture experts and teachers to provide vocational education to African countries, as well as to increase the number of African personnel trained in agro-technology and administration in China, in order to improve overall agricultural technology and management. 3.1.5. The Chinese side will help African countries develop water conservancy and irrigation projects, implement the project of "Agriculture Leads to Prosperity" in 100 African villages, provide African countries with emergency food assistance. 3.1.6 The two sides will actively cooperate in agricultural project designing, financing and management under the framework of the CAADP, as implemented through the AU and NEPAD, and offer support to feasibility studies on agricultural infrastructure construction. 3.1.7 The Chinese side will continue to work with African countries to jointly implement high quality and high yield agricultural demonstration projects, encourage and guide China's agro-science research organizations and enterprises to work with their African counterparts to carry out experimental demonstrations for high-quality and high-yield agriculture, establish "10+10" cooperative mechanism among China-Africa agro-science research institutions, focus on facilitating joint research on breeding and the production of seeds as well as plant protection, specifically focusing on increasing outputs of grain, cotton and other key crops in African countries. 3.1.8 The Chinese side will encourage and support Chinese enterprises to invest in agriculture in Africa; implement cooperation projects focusing on technical support in grain planting, storage, sanitary and phytosanitary requirements, animal husbandry, agro-processing capacity, forestry, and fisheries to create a favourable environment for African countries to realize long-term food security supported by national agricultural production and processing. 3.1.9 The two sides will encourage the trade of agricultural products, improve trade policies, assess methods to promote agricultural trade, and continuously scale up the trade of agricultural products between China and Africa. 3.1.10 The Chinese side will continue to strengthen agricultural cooperation with Africa under the framework of the UNFAO "Special Programme for Food Security", and explore prospects of working with other institutions and countries to realise further agricultural cooperation with Africa. 3.1.11 The African side pledges to cooperate with the Chinese side in key fields such as exchanges on agricultural policies, agricultural infrastructure improvement, development of systems of agricultural support services, modern agricultural development capacity building, and investment in the complete value chain of agriculture to improve Africa's agricultural production and strengthen its capability to ensure food security. It will create an enabling environment for Chinese enterprises to invest and trade in agriculture in Africa, and offer support that includes preferential policies in agriculture, land, agricultural infrastructure, fiscal financing and insurance service, in accordance with local laws. 3.2.1 The two sides believe that industrialization is an imperative to ensure Africa's independent and sustainable development. There are mutual needs for industry partnering and industrial capacity cooperation between China and Africa. Both sides enjoy respective advantages and will bring opportunities to each other. The two sides are ready to combine China's competitive industries and high-quality industrial capacity with Africa's industrialization and economy diversification to promote bilateral cooperation aimed at comprehensive transformation and upgrading. 3.2.2 The two sides commit to following a balanced approach to interests and principles, win-win cooperation, openness and inclusiveness, market-based cooperation, and will actively carry out industry partnering and industrial capacity cooperation, while never pursuing development at the cost of the long-term interests and environments of their host countries. 3.2.3 The two sides will make full use of the existing multilateral and bilateral cooperation mechanisms, enhance planning, policy coordination and industry partnering, and promote the mutually beneficial development of industrial capacity. 3.2.4 The Chinese side is willing to give priority to Africa in industrial partnering and industrial capacity cooperation. The African side welcomes the transfer of labour-intensive competitive industrial capacities of China to Africa in an orderly way, assisting Africa to increase employment, taxation and foreign exchange, and achieving technology transfer and common development. The two sides agree to select several African countries to set up pilot and demonstration programmes, jointly establish or upgrade a number of industrial parks and support the development of infrastructure and public services facilities to accumulate experience, explore effective methods and offer a cooperation model for driving forward China-Africa industrial partnering and industrial capacity cooperation in a comprehensive and orderly fashion. 3.2.5 The Chinese side will set up a China-Africa production capacity cooperation fund, with an initial pledge of US$10 billion, to support China-Africa industry partnering and industrial capacity cooperation. 3.2.6 The Chinese side will send senior government experts and consultants to Africa countries to offer advice and assistance on industrialization layout, policy planning, operation and management. 3.2.7 African countries will continue to improve laws, regulations and infrastructure, introduce preferential policies and improve government services wherever possible, so as to create enabling conditions and an environment to attract investment by Chinese companies and support industries and industrial capacity from China, where mutually beneficial. 3.3.1 The two sides agree that underdeveloped infrastructure is one of the bottlenecks hindering independent and sustainable development of Africa. The two sides will take concrete measures and give priority to encourage Chinese businesses and financial institutions to expand investment through various means, such as Public-Private Partnership (PPP) and Build-Operate-Transfer (BOT), to support African countries and the African flagship projects, in particular the Programme for Infrastructure Development in Africa and the Presidential Infrastructure Championing Initiative, in their efforts to build railroad, highway, regional aviation, ports, electricity, water supply, information and communication and other infrastructure projects, support African countries in establishing 5 transportation universities and facilitate infrastructure connectivity and economic integration in Africa. 3.3.2 According to the plan of building transnational and trans-regional infrastructure in Africa, the two sides will explore and cooperate on the planning and construction of projects to achieve sub-regional connectivity and integration. The two sides will combine the national development demands and the projects' economic benefits, and drive Africa's infrastructure construction in a balanced and orderly way. 3.3.3 The two sides will enhance planning and coordination on the construction and renovation of highway networks in Africa, in particular promoting construction of transnational highway networks in Africa. 3.3.4 The two sides will jointly formulate the China-Africa Railway Cooperation Action Plan (2016-2020), promoting the construction of railway networks in Africa. 3.3.5 The two sides will implement the China-Africa regional aviation cooperation programme, actively supporting the establishment of transnational regional aviation networks linking African countries, and enhancing coordination and cooperation in standards, planning consultation, special training, improving aviation infrastructure, operating joint venture airlines, and offering regional civil airlines, taking into consideration local employment, sourcing, human capacity building and the transfer of technology. 3.3.6 The two sides will support each other on aviation market access, encourage and support more flights and shipping links between China and Africa by their airlines and shipping companies. The two sides encourage and support investment by competitive Chinese enterprises in ports, airports, and airline companies in Africa. 3.3.7 The Chinese side will explore the possibility of establishing a China-Africa civil aviation school in Africa, build infrastructure for aviation ground services, and enhance training of African civil aviation professionals, including technology transfer. 3.3.8 The two sides encourage and support the participation of Chinese businesses in investment, construction and operation of power projects in Africa through multiple means, including expanded cooperation in water resources, coal-fired power, solar energy, nuclear energy, wind power, biomass power generation, power transmission and transformation, and grid construction and maintenance. 3.3.9 The two sides will enhance exchanges and cooperation between departments in charge of information, communications, radio and television, and will increase personnel training in the information field, share experiences of development in information and communication, and work together to safeguard information security. 3.3.10 The two sides encourage Chinese enterprises to assist African countries' efforts to put in place digital radio and TV broadcasting systems, to promote digitalization of radio and TV services, and to benefit more people in the rural areas in Africa. 3.3.11 The two sides encourage and support the participation of competitive Chinese enterprises of information, communication, radio and TV in building information infrastructure in Africa, such as cable networks and interconnection networks, and their involvement in mutually beneficial construction, operation and offering of services with African businesses in order to assist Africa to build information networks covering the whole continent. 3.3.12 The two sides will actively explore and push forward cooperation in information and communication technology, help African countries to build "Smart Cities", and enhance the roles of information and communication technology in safeguarding social security, and fighting against terrorism and crime. 3.3.13 The two sides will cooperate with international organizations such as International Telecommunication Union, narrow the digital divide in Africa, and promote the building of an information society in Africa. 3.4.1 In view of the strong complementarity and cooperation potential between China and Africa in energy and natural resources, the two sides will encourage cooperation in the exploitation of resources, and support joint development and proper use of the energy and natural resources of the two sides, including beneficiation at the source. 3.4.2 The two sides will enhance African countries' capacity for intensive processing of energy and natural resource products during their cooperation, ensuring increased local employment and value addition of primary products, while protecting the local eco-environment. 3.4.3 The two sides will encourage energy and resources cooperation, support Chinese and African enterprises and financial institutions to conduct mutually beneficial cooperation, in particular encouraging these enterprises to assist the African side with beneficiation technologies through technology transfer and capacity building, thus helping African countries to translate their energy and natural resources potential into real socio-economic development. 3.4.4 The two sides agree to establish a training programme for the capacitation of African energy practitioners through research and development exchanges. 3.4.5 The two sides will encourage the establishment of a forum on energy and natural resources under the framework of FOCAC. 3.5.1 The African side welcomes the Chinese side's championing "the 21st Century Maritime Silk Road", which includes the African continent, and the two sides will promote mutually beneficial cooperation in the blue economy. 3.5.2 The two sides will enhance experience sharing in offshore aquaculture, marine transportation, shipbuilding, construction of ports and port industrial parks, the surveying and exploitation of offshore oil and gas resources, marine environment management, marine disaster prevention and reduction, marine scientific research, blue economy development, and support mutually beneficial cooperation between Chinese and African enterprises, in order to assist Africa to cultivate new economic growth drivers. 3.5.3 The Chinese side will enhance marine exchanges and technology cooperation with African countries, launch capacity building, and actively explore the possibility of jointly building marine observation stations, laboratories, and cooperation centres. 3.5.4 The two sides will encourage the establishment of a Ministerial Forum on marine economy under the framework of FOCAC. 3.6.1 The two sides will expand cooperation in tourism to encourage opening more direct air routes and tourism investment, increase tourism safety and quality, expand personnel exchanges aimed at skills training, and cultivate new economic growth drivers for Africa. 3.6.2 The two sides will continue to facilitate travels by their nationals between China and Africa and support tourism promotion activities in each other's countries and regions. 3.6.3 The Chinese side welcomes more eligible African countries to apply for the Approved Destination Status for Chinese tourists. 3.6.4 The two sides encourage and support the establishment of tourist offices in China and Africa, encourage and support investment by Chinese enterprises in tourism infrastructure in Africa, such as hotels and construction of tourist attractions. 3.7.1 The Chinese side will scale up its investment in Africa, and plan to increase China's stock of direct investment in Africa to US$100 billion in 2020 from US$32.4 billion in 2014. 3.7.2 The two sides will continue to encourage and support mutual investment, urge for negotiations and implementation of measures on the Promotion and Protection of Investment, ensure a conducive environment for mutual investment, promote investment cooperation, and safeguard the legitimate rights and interests of investors. 3.7.3 The two sides will actively carry out tax cooperation, negotiate and implement agreements on the avoidance of double taxation, and agree to resolve cross-border tax disputes to promote a favourable tax environment for China-Africa investment, economic exchanges and trade. The Chinese side will actively advocate signing the memorandum of bilateral tax cooperation with African national tax authorities, and support African countries to improve tax collection and administration capacities through technology assistance and transfer, and human capacity development. 3.7.4 The Chinese side will continue to support the development and operation of overseas business cooperation zones, special economic zones and industrial parks by competitive Chinese enterprises, while respecting the host countries' market rules and industrialization processes. The two sides will continue to give support and offer necessary facilitation and services to those overseas business cooperation zones that are already built or operated, taking into consideration local procurement and employment, as well as technology transfer in the countries in which they invest. 3.7.5 The two sides agree to ensure a conducive environment for increased mutual investment and to foster enterprise cooperation. The Chinese side will support the African side in its efforts to build industrial park zones and special economic zones, help African countries to attract investment, encourage and support the involvement of Chinese enterprises in the planning, designing, construction, operation and management of such zones. Local procurement and employment as well as technology transfer in the countries of investment will be taken into consideration. 3.7.6 The two sides will encourage industrial partnering and industrial capacity building to assist Africa to industrialize. The two sides will also encourage and support China's labour-intensive industries to move to Africa, cooperate on import-substitution and export-orientation, increase local employment, technology transfer, human capacity development and enhance export earning capacity. 3.7.7 The two sides will cooperate with international financial institutions and support the holding of Investing in Africa Forum and the establishment of Investing in Africa Think Tank Union, to share China's development experience, promote investment cooperation in Africa, and realize common development. 3.8.1 The two sides will scale up trade and try to elevate the China-Africa trade volume to US$400 billion in 2020 from US$220 billion in 2014 ensuring that the rate of growth is maintained in overall trade figures and that balance in trade is the desired outcome. 3.8.2 The two sides encourage and support the establishment of logistics centres by Chinese enterprises in Africa, standardize and improve quality of commodities exported from China to Africa, promote China's trade with Africa and encourage Chinese enterprises to engage in processing and manufacturing in Africa, ensuring local employment, technology transfers and human capacity development. 3.8.3 The two sides will enhance cooperation in entry-and-exit inspections and quarantine of animals and plants, and food safety and phytosanitary supervision, and promote the entry of food and agricultural products into each other's markets. 3.8.4 The Chinese side will implement 50 trade-promotion assistant programmes, supports the trade liberalization process in Africa and will continue to help African countries to improve facilities for trade and transport, for the beneficiation of African countries' products at the source, and to promote exports of products from Africa to China. 3.8.5 The Chinese side will continue to help African countries to strengthen capacity building in the trade in services, cultivate more professionals in various sectors of the service outsourcing industry, and expand exchanges, cooperation and training in the service outsourcing industry. 3.8.6 The Chinese side will continue to actively fulfil its pledge of giving zero-tariff treatment to the least developed African countries for most of their commodities exported to China, and gradually give zero-tariff treatment to products under 97% of all tariff items from the Least Developing Countries in Africa having diplomatic relations with China, according to the respective bilateral exchanges of letters. 3.8.7 The Chinese side will establish with African countries cooperation mechanisms on customs, inspection and quarantine standards, as well as the verification, certification and administration of imports and exports, in order to promote bilateral trade facilitation, and enhance law-enforcement cooperation to combat smuggling and fraud and to improve the quality of goods exported from China to Africa. 3.8.8 The Chinese side will conduct e-commerce cooperation with Africa, continue to help improve the local management capability and capacity of exporting African countries, develop and construct an internet visa system, introduce electronic certificates of origin, and promote paperless customs clearance of certificates of origin. 3.9.1 The Chinese side will offer African countries US$35 billion of loans of concessional nature on more favorable terms and export credit line, create new financing models, optimize favorable credit terms and conditions, expand credit scales, and support China-Africa industrial capacity cooperation, infrastructure building, and development of energy resources, agriculture, and manufacturing in Africa. 3.9.2 The Chinese side will encourage Chinese financial institutions to provide financing and insurance support for China-Africa cooperation in energy, mining, agriculture, processing manufacturing, shipping, metallurgy, construction materials, information and communication technology, electricity, railways, highways, ports and airports. 3.9.3 The Chinese side will enhance cooperation in currency exchanges and financial services, and encourage both Chinese and African enterprises to invest and trade in local currencies. The Chinese side welcomes central banks of African countries to invest in China's inter-bank bond market and include RMB into their foreign exchange reserves. 3.9.4 The Chinese side will encourage and support Chinese and African financial institutions to strengthen cooperation, including opening more branches in respective countries and enhancing exchanges and cooperation ensuring mutual benefit, as well as encouraging and supporting cooperation among financial institutions primarily supporting development to further enhance China-Africa financial cooperation. 3.9.5 The Chinese side will gradually expand the China-Africa Development Fund from US$5 billion to US$10 billion. 3.9.6 The Chinese side will gradually expand the Special Loans to Support Small and Medium Sized Enterprises in Africa from US$1 billion to US$6 billion. 3.9.7 The Chinese side will enhance cooperation with the African Development Bank and the sub-regional financial institutions, utilizing optimally the China-Africa Development Fund, Africa Growing Together Fund, and Special Loans to Support Small and Medium Sized Enterprises in Africa, also exploring and innovating cooperation mechanisms, supporting the development of infrastructure, agriculture and industrialization processes in Africa. 4.1.1 The African side highly appreciates China's longstanding assistance for social development and humanitarian assistance, without any political conditions, in diverse forms that help Africa to eradicate poverty and improve people's livelihood under the framework of South-South cooperation. The African side applauds the establishment of the Assistance Fund for South-South Cooperation by China to support African countries in implementing the 2030 Agenda for Sustainable Development. 4.1.2 The Chinese side will continue to gradually scale up its assistance to African countries within its capacity, giving priority to enhanced cooperation with African countries in areas pertaining to people's livelihoods such as agriculture, health, infrastructure, education and human resources development, wildlife and environmental protection, while increasing the effectiveness of assistance, and supporting economic and social development of African countries. 4.1.3 The Chinese side will exempt the outstanding intergovernmental interest-free loans due by the end of 2015 owed by the least developed countries, land-locked countries and small island developing countries in Africa. 4.2.1 The African side expresses its appreciation for China's continued assistance to countries in need. In particular, the African side expresses its deep appreciation for China's rapid response to the Ebola Virus Disease crisis in West Africa and commends the latter for its selfless service and deployment of its expertise and resources to arrest and reverse the spread of this disease. The African side further appreciates China's continued support to reconstruct public health, economic and societal systems of affected countries during the Post-Ebola period. 4.2.2 The Chinese side will assist Africa to develop public health systems and policies, help African countries to improve the public health, surveillance, epidemiological and prevention systems, strengthen prevention and treatment of malaria and other common infectious and communicable diseases in Africa, enhance the assistance in maternal and child health, reproductive health and other major public health fields in Africa, support cooperation between 20 hospitals of China and Africa from each side on demonstration projects, upgrade hospital departments, and will continue to train doctors, nurses, public health workers and administrative personnel for African countries. 4.2.3 The Chinese side will support the building of an African Union Disease Control Centre and regional medical research centres, reinforce laboratory and diagnostic capacities and encourage the African Union Commission to play a leading role as the custodian of Africa's continental initiatives in the health sector. 4.2.4 The Chinese side will continue to send medical teams to Africa, including short-term medical teams consisted of clinical experts to African countries, and conduct the "Brightness Action" surgeries and other short-term free medical services in Africa, and provide Africa with doses of anti-malaria compound artemisinin. 4.2.5 The Chinese side will support the investment by Chinese medical and health care enterprises in Africa, encourage Chinese medical institutions and enterprises to jointly operate hospitals and produce medicines in Africa, improve health information systems, help Africa to improve the availability of health and diagnostic services and commodities, and improve Africa's capacity for independent and sustainable development in the field of medical care and health, support Africa's continental health initiatives. 4.2.6 The Chinese side will improve health infrastructure in Africa through the construction, renovation and equipping of medical facilities. 4.2.7 The Chinese side will continue to strengthen high-level exchanges in health, build an institutionalized high-level dialogue between China and Africa and agree to incorporate the Ministerial Forum on China-Africa Health Cooperation as an official sub-forum under the framework of FOCAC. 4.3.1 The two sides agree that the shortage of professional and skilled persons is another major bottleneck constraining Africa's independent and sustainable development. Both sides will further strengthen cooperation in education and human resources development. 4.3.2 The Chinese side will offer 2,000 degree education opportunities in China and 30,000 government scholarships to African countries, welcome more African youths to study in China, innovate and expand more ways for training, and train more African professionals on economic development and technical management. 4.3.3 The Chinese side will train for Africa senior professionals on government administration for national development through the South-South Cooperation and Development Institute. 4.3.4 The two sides will continue to implement the 20+20 Cooperation Plan for Chinese and African Institutions of Higher Education, improve the cooperation mechanism between Chinese and African institutions of higher education, encourage Chinese and African universities to carry out cooperation in regional and country studies, and support African universities in establishing China research centres and vice versa. 4.3.5 The Chinese side welcomes the inclusion by African countries of Chinese language teaching as part of their national education systems and will support more African countries in their efforts to establish Confucius Institutes and Confucius Classrooms. 4.3.6 The Chinese side will assist African countries to renovate existing as well as build more vocational and technical training facilities, establish a number of regional vocational education centres and colleges for capacity building in Africa, train 200,000 local African vocational and technical personnel and provide Africa with 40,000 training opportunities in China; help the youth and women improve their employment skills to enhance the self-development ability of Africa. 4.3.7 Having noted the successful UNESCO-China Funds-In-Trust established in UNESCO by the Chinese side, the two sides support the continued implementation of funds-in-trust and its extension by two years (2016-2017). 4.4.1 The two sides will use the "Programme for Strengthening Cooperation on Poverty Reduction between the People's Republic of China and the African Union" jointly published in 2014, as a guide to further strengthen experience sharing in poverty eradication and practical cooperation. 4.4.2 The two-sides agree to continue to jointly organize the China-Africa Poverty Eradication and Development Conference and to endorse it as an official sub-forum under the framework of FOCAC, in order to explore in-depth poverty eradication strategies and policies, and to gradually establish a multi-level inter-governmental and inter-society dialogue mechanism for poverty eradication. 4.4.3 The Chinese side will continue to host the workshop on poverty eradication policies and practice tailored to the needs of African countries, offer educational programmes with degrees on poverty eradication and development for African countries, and help Africa to train specialized personnel in the field of poverty eradication and development. 4.4.4 The Chinese side will, in conjunction with African countries carry out village-community-level small-scale demonstration projects on poverty eradication and cooperate to implement village-community-level comprehensive development projects, help implement Satellite TV projects in 10,000 villages in Africa. 4.4.5 The Chinese side will work with African countries and relevant institutions to launch joint research projects, offer consultancy services on poverty eradication policies for African countries, and send experts and/or volunteers for technical support. 4.4.6 The two sides will mobilize resources including non-governmental organizations to implement in Africa 200 "Happy Life" projects and poverty reduction programmes focusing on women and children. 4.5.1 The two sides will continue to promote the implementation of the "China-Africa Science and Technology Partnership Plan", build joint laboratories / joint research centres in the priority fields of common interest, jointly build agriculture science and technology demonstration parks and assist outstanding African youths and technical personnel to participate in exchanges to and training in China. 4.5.2 The two sides attach importance to knowledge sharing and technology transfer, and will carry out exchanges in technological innovation policies and the building of science and technology parks and encourage research institutions and enterprises to have intensive cooperation. 4.5.3 The two sides will actively launch cooperation in the field of space sciences, and the Chinese side will train professional personnel and share development experience with African countries. 4.5.4 The parties will continue to implement joint research and technology demonstration projects. The two sides will also step-up cooperation in research exchanges through their institutions of higher learning. 4.5.5 China will continue its support of the Square Kilometre Array project, which is a flagship science and technology project of the African continent. The two sides will design joint research projects around the SKA and facilitate the participation of their scientists in the project. 4.6.1 The two sides are satisfied with the progress of cooperation in environmental protection and addressing climate change and will continue to strengthen dialogue on these areas of interest, as well as work closely together on the management of border facilities, search, seizure, and destruction of poached resources, and intelligence gathering to undermine the responsible syndicates, acknowledging their linkages to international organized crime. 4.6.2 To enhance China-Africa environmental cooperation and promote African countries' green development, the Chinese side will introduce the "China-Africa Green Envoys Programme", set up the China-Africa Environment Cooperation Centre, and launch the China-Africa Green Innovation Project under the framework of "China South-South Environmental Cooperation-Green Envoys Programme". China will cooperate with the African side to launch environmental friendly technology cooperation, redouble its efforts to provide training for Africa in the fields of eco-environment protection, environment management and pollution prevention and treatment, push forward dialogue and cooperation on China-Africa green finance, and explore a model of environmental cooperation between Chinese and African governments and non-governmental capital. 4.6.3 The two sides will work together to promote the development of the "China-Africa Joint Research Centre" project and cooperate in biodiversity protection, prevention and treatment of desertification, sustainable forest management and modern agriculture demonstration. The Chinese side will support Africa in implementing 100 clean energy and wild life protection projects, environment friendly agricultural projects and smart city construction projects. 4.6.4 The African side highly appreciates that the Chinese government supports Africa in its efforts to protect wildlife resources. The two sides will strengthen cooperation in the area of wildlife protection, help African countries to improve the protection capabilities, build the capacity of environmental rangers, provide African countries with training opportunities on environmental and ecological conservation, explore the possibility of cooperating on wildlife protection demonstration projects and jointly fight against the illegal trade of fauna and flora products, especially addressing endangered species poaching on the African continent, in particular elephants and rhinos. 4.6.5 The two sides agree to work together to improve management of water resources, and rehabilitate disused mines. 4.6.6 China will advance cooperation with African countries in environmental surveillance, continue to share with African countries the data from the China-Brazil Earth Resources Satellite and promote the application of the data in land use, weather monitoring and environmental protection in Africa, discuss the establishment of meteorological satellite data receiving and processing application system. 4.6.7 The two sides will strengthen the policy dialogue on climate change, deepen China-Africa cooperation in tackling climate change, in particular climate change monitoring, risk and vulnerabilities reduction, strengthening resilience, promoting adaptation, support for mitigation in terms of capacity building, technology transfer as well as financing for monitoring and implementation and improve the China-Africa consultation and collaboration mechanism on climate change. 4.6.8 The African side welcomes the announcement by the Chinese side that it will make available 20 billion Renminbi Yuan for setting up the China South-South Cooperation Fund to support other developing countries to combat climate change, including to enhance their capacity to access Green Climate Fund funds. The two sides agree to enhance China-Africa South-South cooperation on climate change, in order to strengthen and add greater content to the cooperation with African countries to enhance their capacity to implement climate change mitigation and adaptation actions. 4.6.9 The two sides will set up a multi-level disaster reduction and relief cooperation and dialogue mechanism, expand exchanges in post-disaster response and recovery, risk assessment, disaster preparedness and recovery education programmes. 4.6.10 In times of emergency disaster responses, the Chinese side will provide rapid mapping service for disaster emergencies based on space technology at African countries' request. 5.1.1 The two sides will promote dialogue between the Chinese and African civilizations and mutual learning between the cultures of the two sides, while respecting the cultural uniqueness of each, work together to uphold the diversity and progress of human civilization and contribute to the development and prosperity of world culture. 5.1.2 The two sides appreciate that events such as the China-Africa Forum on Cultural Heritage Protection and China-Africa Cultural Industry Round-table provide an effective platform for bilateral exchanges in cultural policies, and will continue to hold similar dialogues. 5.1.3 The two sides agree to maintain the momentum of high-level inter-governmental mutual visits and dialogue in the cultural field and will continue to follow through on the implementation plan of the China-Africa bilateral government cultural agreements. 5.1.4 The two sides will continue to build brand activities such as "Happy Spring Festival", "Chinese and African Cultures in Focus", "Experience China" and hold large-scale cultural exchange activities such as "Africa Arts Festival" at an appropriate time. 5.1.5 The two sides appreciate the hosting of a "Country Year" in their respective countries and encourage more eligible African countries to hold "Country Year" activities with China to deepen understanding of and exchanges between each other. 5.1.6 The two sides will continue to implement "the Programme of China-Africa Mutual Visits between Cultural Personnel" and "China-Africa Cultural Partnership Programme" and support the exchanges and cooperation between Chinese and African culture and art managers, artists and cultural institutions. 5.1.7 The two sides will encourage and support the participation by Chinese and African art and culture groups and artists in international culture and art activities. 5.1.8 The two sides will continue to advocate for the establishment of cultural centres in China and Africa. The Chinese side will help build 5 cultural centres for Africa, and to establish more permanent platforms for cultural exchanges and cultural cooperation. 5.1.9 The two sides will strengthen human resources training in the cultural field. The Chinese side will establish ten major "Culture Training Bases for Africa" and execute the "One Thousand People Programme" for culture training in Africa. 5.2.1 The Chinese side will continue to implement the China-Africa Press Exchange Centre programme, continue to hold training and capacity building seminars for African countries' news officials and reporters, promote more exchanges and mutual visits between Chinese and African journalists and press professionals, train 1,000 African media professionals each year and support exchanges of reporters by more media organizations. 5.2.2 The Chinese side will actively provide technology support and personnel training for the digitalization of radio and TV services and industrial development in Africa. The African side welcomes the involvement of Chinese enterprises in investment and cooperation in building and operating radio and TV transmission broadcasting networks and the marketing of programmes, while ensuring local human capacity building and employment. 5.2.3 The two sides will provide films and TV programmes to each other's respective national broadcasting agencies, explore a long-term cooperative model, continue to participate in film and TV festivals and exhibitions held in their countries, encourage activities of holding film and TV programme exhibitions, and actively launch joint production of documentaries, films and TV programmes. The Chinese side further encourages African countries to produce programmes, conduct exchanges and promote African films and programmes in China. 5.2.4 The Chinese side will continue to take an active part in international book fairs in Africa and carry out cooperation in English book publishing. The Chinese side will encourage Chinese publishing enterprises to donate books on Chinese language learning and other Chinese publications to prestigious African public libraries and the libraries of higher and secondary learning institutes that address fields such as health, agricultural technology, culture and education. 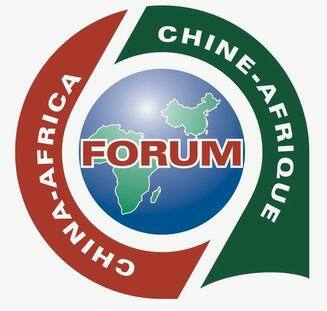 The two sides will hold a Forum on China-Africa Publishing Cooperation at an appropriate time. 5.2.5 The Forum on China-Africa Media Cooperation serves as an important platform for China-Africa media cooperation and cultural exchanges. The two sides agree to institutionalize the Forum as an official sub-forum of FOCAC. 5.3.1 The two sides note with satisfaction that the "China-Africa Joint Research and Exchange Plan" has been successfully implemented, which has effectively strengthened cooperation and exchanges between scholars and think tanks of the two sides and provides strong academic support to China-Africa cooperation. 5.3.2 The two sides will continue to hold "FOCAC-Think Tank Forum" and support the building of long-term and stable cooperation between the Chinese and African academia. The two sides further encourage the Forum and research institutions to conduct joint research on themes such as China-Africa industry partnering and industrial capacity cooperation and African industrialization and agricultural modernization to provide strong intellectual support and innovation to China-Africa's win-win cooperation and common development. 5.3.3 The two sides will continue to implement the "China-Africa Think Tank 10+10 Partnership Plan" and encourage think tanks from both sides to expand cooperation, and invite 200 African scholars to visit China each year. 5.3.4 The two sides welcome and encourage support by Chinese and African enterprises, financial institutions and academic institutions for academic interactions and people-to-people and cultural exchanges between China and Africa. 5.4.1 The two sides take note of the successful holding of the 3rd and 4th China-Africa People's Forum, and believe that the institutionalization of the Forum has played an active part in boosting friendship between the Chinese and African peoples. 5.4.2 The two sides appreciate that the "China-Africa People-to-People Friendship Action" and the "China-Africa People-to-People Friendship Partnership Plan" have yielded positive results. The two sides agree to continue small and micro social livelihood projects, promote mutual visits by non-governmental organizations, and encourage and support extensive people-to-people exchanges and cooperation between these organizations. 5.4.3 The two sides appreciate the institutionalization of the China-Africa Young Leaders Forum, which serves as an important platform for China-Africa youth dialogue and cooperation. 6.1.1 The Chinese side continues to support the African Union, its Regional Economic Communities and other African sub-regional institutions that play a leading role in coordinating and solving issues of peace and security in Africa and further continues to support and advocate for African solutions to African challenges without interference from outside the continent. 6.1.2 The Chinese side will provide the AU with US$60 million of free military assistance over the next three years, support the operationalization of the African Peace and Security Architecture, including the operationalization of the African Capacity for the Immediate Response to Crisis and the African Standby Force. 6.1.3 The two sides will maintain the momentum of mutual visits by defence and military leaders, continue to deepen exchanges on technologies and expand personnel training and joint trainings and exercises. 6.1.4 The two sides will strengthen information and intelligence exchanges and experience sharing on security, and will share this information timeously to support mutual efforts in the prevention and fight against terrorism, in particular its symptoms and underlying causes. 6.1.5 The two sides will enhance cooperation in preventing and combatting the illegal trafficking of humans, fauna and flora products, marine products, narcotics, psychotropic substances and precursor chemicals. 6.1.6 The two sides will continue to support the United Nations (UN) in its efforts to play a constructive role in helping resolve regional conflicts in Africa and will intensify communication and coordination with the UN Security Council. The Chinese side will continue to take an active part in UN peacekeeping missions in Africa, offer the African side support on peacekeeping training and intensify communication and coordination with Africa in the UN Security Council, in adherence to UN Security Council Resolution 2033 that recognizes the importance of an enhanced relationship between the United Nations and the African Union, as well as a strengthened capacity of regional and sub-regional organizations, in particular the African Union, in conflict prevention and crisis management, and in post-conflict stabilization. 6.1.7 The African side appreciates the efforts of the Chinese government's Special Representative for African Affairs to actively engage in mediation efforts in Africa, and welcomes his continued constructive role in Africa's peace and security endeavours. 6.1.8 The African side appreciates China's counter-piracy efforts in the Gulf of Aden, the Gulf of Guinea and in waters off the coast of Somalia in accordance with the relevant resolutions of the UN Security Council. The two sides will strengthen cooperation on safeguarding the security of shipping routes in the waters concerned and peace and stability in the region. In this regard, the two sides agree that emphasis should also be placed by the international community on addressing the root causes of piracy, namely poverty, underdevelopment and illegal fishing. 6.2.1 The two sides will strengthen consular cooperation and actively carry out consultations on consular matters. 6.2.2 The two sides will strengthen cooperation between immigration departments and jointly fight against illegal immigration and to protect environmental resources from illegal exploitation. The Chinese side will support African countries in enhancing anti-riot capacity. 6.2.3 The two sides will explore the signing of Criminal Judicial Assistance and Extradition Treaties and strengthen cooperation in the fields of combatting and preventing transnational crimes, human trafficking, corruption and the illegal trade in fauna, flora and associated products, while strengthening narcotics control, fugitive extradition, repatriation of illicit funds and asset recovery, cyber security, and law enforcement capacity building. 6.2.4 The two sides will promote exchanges and cooperation in the judicial, law enforcement and legislative fields, including preventing and fighting transnational organized crimes in accordance with bilateral treaties and multilateral conventions. 6.2.5 The two sides will improve exchanges and cooperation on the judiciary, obtain in-depth understanding of respective legal systems, and promote mutual recognition and application of laws and regulations, so as to provide legal support and a law-based environment for personnel exchanges and the protection of legitimate rights and interests. 6.2.6 The two sides will improve the institutionalization of the "FOCAC-Legal Forum", continue exchanges and training of legal professionals, work together to establish a "China-Africa Joint Arbitration Centre", develop the Professionals Legal Training Base and China-Africa Legal Research Sub-Centre in Africa, and facilitate lectures by law experts from China and Africa. The two sides will actively support the implementation of "China-AALCO Research and Exchange Programme on International Law". At present, international relations and the global landscape are undergoing and will continue to undergo profound and complex changes, including in terms of globalization and the spread of information. It serves the common interests of China and Africa to strengthen international coordination and to establish a new model of global development that is based on equality, accountability, mutual respect and that is more balanced, stable, inclusive and harmonious. The two sides are committed to supporting each other in international fora and further strengthen cooperation in areas of trade, finance, environmental protection, peace and security, cultural exchanges, economic and social development and the advancement of human rights, while maintaining the sovereignty to choose their developmental paths. 8.1 The two sides are satisfied that, since the 5th FOCAC Ministerial Conference, the political consultation between Chinese and African Foreign Ministers on the side-lines of the UNGA, the Senior Officials Meeting (SOM), and consultations between the Secretariat of the Chinese Follow-up Committee and African diplomatic missions in China have continued to operate in an efficient and smooth manner. 8.2 The two sides agree that the Co-chairs, in cooperation with the Chinese FOCAC Follow-up Mechanism and the Group of African Ambassadors in Beijing, should conduct a review of FOCAC and develop recommendations to further strengthen FOCAC, drawing on the experience of the last 15 years, including relating to the optimal follow-up mechanism, the functioning of the various agreed FOCAC Sub-Forums including the establishment of certain new sub-forums, and the promotion of the institutionalization of existing sub-forums. 8.3 Following the FOCAC follow-up mechanism procedures, the two sides decided to hold the 7th Ministerial Conference in Beijing in 2018 and, before that, the 12th and 13th SOMs in Beijing in 2017 and 2018 respectively. The 4th political consultations between Chinese and African Foreign Ministers on the side-lines of the UNGA will be held in New York in September 2016. The slow down of Chinese economy has been making headlines around the world, however there are a number of Chinese emerging cities where the economy is not only growing, but by double digits and accelerating. Guiyang is the capital of Guizhou province in Southwest China. Guizhou has traditionally been a poor province with an economy heavily relying on state owned enterprises. With the population of 2.8 million, it is now fast becoming a hub of operations for Chinese telecom companies and “Big Data”. Private companies are also following the lead with Alibaba setting up cloud-computing facilities in the city. Guiyang also serves as an important transportation hub for South Western China: the Guiyang–Guangzhou High-Speed Railway began operations in December 2014. Three more high-speed rail lines to Chongqing, Kunming, and Changsha will commence operations within the next few years. Whilst disposable income per person is currently around USD 5,100/year, almost half of China’s average of USD 9,800/year, this is quickly rising.. The city of Guiyang is one of China's three largest phosphate ore bases, with phosphate ore reserves of 428 million tons and more than 70 percent of the country's phosphate ore. The ore reserves in Kaiyang county alone amount to 390 million tons, or a third of the nation’s high-grade ore. The high-grade phosphorus pentoxide ore accounts for 78 percent of China's total. It also has three chemical industry bases -- the Kaiyang Phosphorus and Coal Chemical Ecological Industrial Demonstration Base, Xifeng Phosphorus and Coal Chemical Ecological Industrial Demonstration Base, and Qingzhen Coal Chemical Base. Total output value of the phosphorus-coal-based chemical sectors in Guiyang, in 2011, was 26.3 billion yuan ($4.29 billion). The phosphorus-coal-based chemical industry is focused on improving output and efficiency, combining its phosphorus, coal, water, and electricity resources. With proven reserves of 424 million tons of bauxite resources the province is a major Aluminum producer. Leading enterprises and producers are: Aluminum Corp of China (Chalco), Guizhou Aluminum Industrial Base, Galuminium Group and R&D institutes such as the Guiyang Aluminum Magnesium Design and Research Institute and the Chalco Guizhou Branch. The industry can produce 3 million tons of bauxite annually, as well as 1.2 million tons of alumina, 450,000 tons of electrolytic aluminum, 300,000 tons of carbon for aluminum use, 50 million tons of refined aluminum, and 200,000 tons of high purity aluminum. Developing the downstream aluminum industry is a current focus in the province. The start of the Chalco aluminium strips project in 2010, with total amount of 150,000 tons and a total investment of 700 million yuan, marked a significant breakthrough in the aluminum deep processing industry in Guiyang. In 2015 Geely Holding Group Co began construction of its new-energy car manufacturing base in Guiyang. The 0.6-square-kilometer factory consists of a modernized production line of punching press, welding, painting and assembly, and will make methanol-powered automobiles. Geely has made a total investment of around 10.2 billion yuan ($1.6 billion) and expects the first car off the production line in 2017. Guiyang's Cigarette Factory, a subsidiary of the China Tobacco Guizhou Industrial Co, is a leading provincial enterprise. In the food sector, Guiyang has 47 food companies, covering poultry, chili peppers, corn, soybeans, rapeseed, peanuts, ginger, onions, and garlic, and 10 other product categories, with hundreds of types of food. The Nanming Food Industry Park and Wudang Food Industry Park are leaders in the food sector in Guiyang. Work on the Longdongbao Food and Light Industry Park, on a 903 hectare space, began in September 2010 and will be completed in 2017. It is expected to pull in 13.6 billion yuan in investment. Work continues on the Wudang Food Industry Park and is expected to bring in nine enterprises during Phase I, and have 1 billion yuan in output value. Guiyang's equipment manufacturing sector is rapidly and becoming a pillar of industry. Guiyang has a comprehensive array of mid-sized to large equipment manufacturers. The Guizhou Jonyang Kinetics Co is a domestic leader in hydraulic excavators, Guizhou Xianfeng Industrial Co is one of the Top 10 producers of large slide grinders and forging equipment and the Guiyang Xintian Oetech Co. focuses on the production of high-tech optical instruments. With its abundance of skilled workforce R&D capacity and production strengths, Guiyang has been able to build an industrial capacity that covers seven equipment manufacturing industries. It has industrial clusters in construction machinery, automobiles and automobile parts and electronic components. With the support of the municipal government, Guiyang's logistics sector has grown and is playing an important role in the local economy. Guiyang is headed to become a regional logistics center with it`s two logistics hubs -- the Guizhou Mengguan International Logistics Center and Longdongbao International Aviation Logistics Park (and three regional logistics parks: Zhazuo Logistics, Qingzhen Logistics, and Jinhua Logistics). It further expects to build: cargo logistics, more distribution centers, dry ports and a bonded zone. Guizhou province is known for its herbal medicines and has turned its pharmaceutical sector into a pillar of industry over the past decade It now has 74 pharmaceutical companies and an industrial structure that covers a diverse range of biological products, Chinese patent medicines, pharmaceutical chemicals, medical consumables, and Chinese medicinal decoctions. China Telecom will invest 4-billion yuan ($469 million) in optical network construction, cloud computing, and big data development over the next three years. 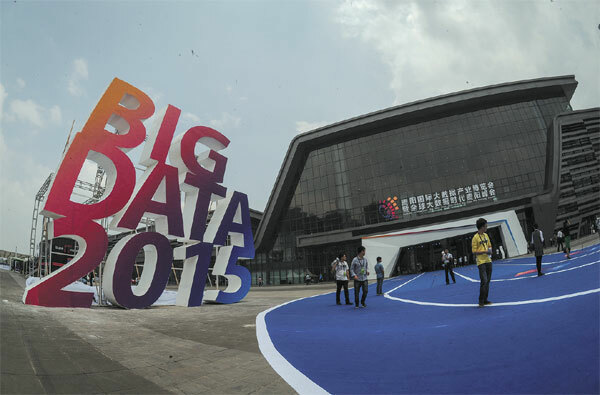 The aim being to turn Guiyang into a major data center for China: the municipal government sees the big data industry as key to its future economic development and has already established preferential policies for big data entrepreneurs. The China Telecom Cloud Computing Guizhou Information Park covers an area of (33.3 hectares) in the Gui'an near the city. The first phase of the park , already completed, comprises eight datacentres, one power centre and two support centres. It is expected to accommodate one million servers. By the end of 2017, cities and towns in the province are expected to have 100-megabyte broadband coverage and a fourth generation network in rural and urban areas and, at the same time, the two will cooperate in a Guiyang cloud computing platform, a municipal data sharing platform, and a Guizhou Internet exchange center. 1. Encouraged industries located in West China are levied corporate income taxes at a discount of 15 percent. Resource taxes for those enterprises are levied via ad valorem instead of specific duties. 2. Qualified high-tech enterprises located in the high-tech industrial development zone approved by the State Council are levied corporate income taxes at a discount of 15 percent. 3. Enterprises established in the different districts and industrial development zones within Guiyang can enjoy local preferential policies. 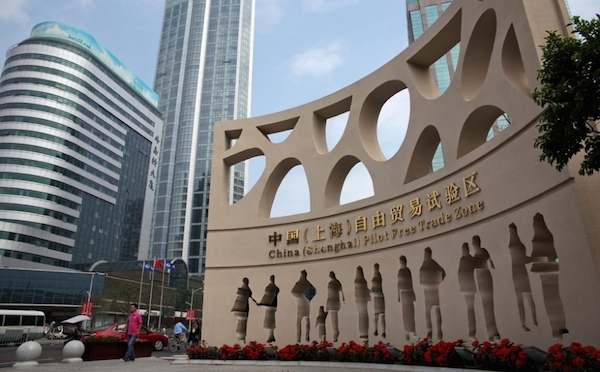 As of last year, the Shanghai municipal government has revised its restricted industries list for foreign investors and updated it for the Free Trade Zone (FTZ). Amendments made to current list are not considered a major change but a revision to the 2014 initiatives. The list below outlines industries where foreign investors are treated differently to domestic companies. There are number of changes where we believe there are various opportunities for new investors in the three FTZs. - Agriculture, crop seeds, fishery and animal husbandry is a critical subject and remains sensitive to Chinese citizens. Fishing in certain waters is due to approval from Chinese government. -All initiatives needs to be approved by concerned government bodies. -rare earths, radioactive materials, tungsten, molybdenum, tin, antimony and fluorite is prohibited. It is restricted for lithium, precious metals and graphite. - Multiple restrictions in manufacturing industry is now lifted. These includes, the processing of rice, corn, edible oils, tea, alcohol, tobacco and chemicals, anesthesia and blood products are now allowed. - Construction vehicles, motorcycles and new energy vehicle batteries is lifted. - It is still prohibited to operate news websites, online publications, online audiovisual programs or broadcasting of information on the internet. Except for music and those sectors that have been lifted as China’s membership of the World Trade Organization. - If a domestic enterprise cooperates with a foreign enterprise to create official online content and news, needs prior approval from National Security Review. - Foreign investors can now set up e-commerce companies in Fujian, Guangdong, Tianjin as well as Shanghai. - Foreign banks may not conduct the following activities, also included in the Commercial Banking Law: acting as an agent to issue, honor and underwrite government bonds, issuance of bank cards and the acting as an agent for receipt and payments of funds. Apart from taking time deposits for Chinese nationals of less than 1 million RMB, foreign banks in China may not engage in RMB activities for Chinese nationals. - The parent company of a foreign invested bank in China must provide its operational funds free of charge. The foreign invested bank must operate with an eight percent RMB capital reserve. Banks providing RMB services must follow the minimum required business hours. - Foreign law firms may only be present in China through a representative office, which is subject to approval. Foreign nationals may not advice on Chinese law or become partners of a Chinese law firm. Representative offices of foreign law firms may not hire Chinese legal professionals, and its support staff may not provide legal advice. - Market research is restricted to contractual or joint ventures with Chinese controlling interest. - Foreign entities may not independently establish schools and educational institutions mainly enrolling Chinese nationals. This does not include "non-academic vocational training"
- Medical institutions can be set up as an equity or contractual joint venture. - Sino-foreign productions of television and film series are subject to a licensing. - Foreign news agencies may set up a representative office in China and employ foreign reporters upon approval of the Chinese government. - Foreign press agencies may provide news services in China upon approval of the Chinese government. - The establishment of performing arts groups in China is prohibited, and performance agencies must have Chinese controlling. Beijing`s satellite townships are now in the spotlight in view of the Governments aim for the integrated development of Beijing, Tianjing and Hebei provinces, know as Jing-Jin-Ji. Over the next 15 years it is planed to transfer non-essential functions out of Beijing to the new townships. A 40 minute metro ride east of Beijing`s CBD area is Tongzhou (pop.1.3 million est. ), where construction of a new CBD area and Universal studios theme park are well under way: built at the intersection of the Beijing & Hangzhou Grand Canals, the new town is expected to cover over 80 square kilometers. Tongzhou will also be home to the new Beijing city Municipal Governmental Offices at Lucheng town: some 6km east of the new CBD. Also expected to relocate are state-owned-enterprises, hospitals and universities. Planners hope the area will draw in a further million people, the first phase of the project due to be opened in 2017. The local government has agreed to fund 86 key projects in the area, setting aside over 160 Billon RMB. Currently housing prices run in the 30,000-40,000 rmb/sqm range. As part of a move to connect and integrate transport, Beijing is to build its third civil airport, Daxing International Airport, located adjacent to Daxing district in Beijing and Langfang in Hebei province. It is due to be completed by the end of 2017 and operational in 2018 it is expected to carry 120 million passengers by 2050. The Biomedical base is 60 minutes, via metro, from Bejing`s CBD area with numerous office and residential complexes already completed. As part of the district's growth, a new 391,000 sq m above- and belowground mixed-use development—dubbed the Vanke-Shoukai Mixed-Use Development Daxing—is also under way, scheduled to be completed in 2017. Beijing will remain the national center of political, cultural, and international exchange activities as well as a technological innovation center. Tianjin municipality will be a national research and development base for advanced manufacturing industry, a shipping hub for north China, a demonstration area for financial innovation, and an experimental area for further reform and opening up. Hebei province will be an important national base for trade and logistics, an experimental area for industrial transition and upgrading, a demonstration area of modern urbanization and coordinated development of urban and rural areas, and an ecological buffer zone. A medium-term aim of the strategy is to control the permanent population of Beijing within 23 million and to relieve air pollution and congestion. 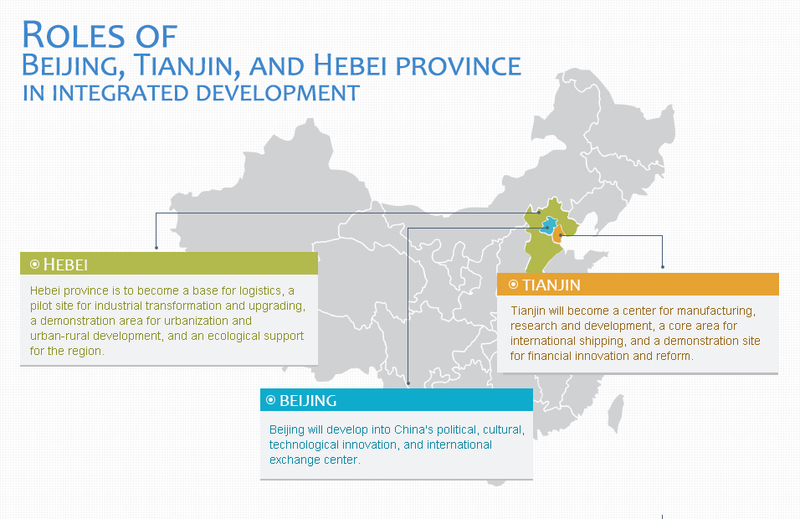 Long term, the strategy aims to form an integrated region of Beijing-Tianjin-Hebei, with a better economic structure, a cleaner environment and improved public services. Industrial Parks in the Jing-Jin-Ji area. Established in 2006, Tongzhou Industrial Park covers two industrial bases: Opto-Mechatronics Industrial Park and Jinqiao Science and Technology Industrial Base. The park has a total planned area of 14.5 square kilometers of which 11.41 square kilometers have already been developed. 360 enterprises have accessed the park, including 30 high and new-tech enterprises at national level and 76 at Zhongguancun park level. Tongzhou Park prioritizes world-class industries of optic-mechanical integration, environmental protection and new energy, high-end equipment manufacturing. The park features microelectronics, optoelectronics, automotive electronics, avionics, advanced equipment manufacturing, intellectual instruments, laser technology, numerical control machine, printing machinery, medical equipment, semiconductor material, environmental protection equipment and auto parts. The park project has so far invested 2.2 billion yuan ($346.28 million) to construct essential infrastructure and thus creates a favorable environment for production and R&D,. Daxing Biomedicine Industrial Base is a biotechnology industrialization base built by the Beijing Municipal Government to revitalize its modern manufacturing industry. Being a bio-industry cluster area for the Bohai Economic Zone and the entire northern region, the base holds industrial functions such as biotechnology indigenous innovation, product R&D, industrialization of technical achievements, R&D and producer services in Beijing. Situated in Daxing New Town in Beijing, 20 kilometers away from the urban area, 50 minutes' drive to Beijing Capital International Airport. The base is not far from Subway Line No.4 and the new international second capital airport. The base has four development and support priorities – biopharmaceutical projects centering on vaccine and protein drugs; the import of modernized and internationalized TCM enterprises to drive the growth of medicine, health care products; the introduction of medical instrument programs to consolidate the leading position of Beijing in the field of instrument and diagnosis; and last but not least is to bring in innovative drugs and high-end generic drug industrialization projects to form preparation products that meet international certification standards. Fengtai Science and Technology Park was established in 1991. It was listed as a national high and new-tech zone in April 1994 and was one of the earliest three sub-parks of the Zhongguancun Science and Technology Park. Fengtai S&T Park realized a total revenue of 195 billion yuan ($30.69) in 2010, and has obtained strong industrial agglomeration effects. The major industries in the park include: electronic information, biomedicine, new materials, new energy, as well as engineering services, rail transit, military aerospace, cultural and creative industries and producer service industry. With more than ten years of development, the park has gradually formed the headquarters of an economic zone and is playing an increasingly important role in the development of southern Beijing. The Beijing Economic Technological Development Area (Yizhuang) is the only state-level economic and technological development zone in the city, a core region for high-tech and modern manufacturing industries. It will become a cluster for the high-tech manufacturing and strategic-emerging industries in southern Beijing. In 2010, the administrative resources of Daxing District and the BDA were integrated to form an industrial development pattern of "one base and six parks" with the BDA as an industrial development main platform to stimulate the planning and construction of six special parks: Daxing Biological Medicine Base, New Media Industrial Park, New-Energy-Vehicle Industrial Park, Military-Civilian Combination Industrial Park, Manufacturing Services Industrial Park and New Airport Industrial Park. By the end of 2011, more than 4,800 enterprises from more than 30 countries and regions had come to the BDA, along with more than 100 projects invested in by 77 of the global top 500 corporations, along with high quality, domestically funded projects. The leading industries are electronic information, bio-medicine, equipment manufacturing and automobile production industries; a communications industry cluster led by Nokia, a display industry cluster led by BOE, a microelectronics industry cluster led by SMIC, a medical equipment industry cluster led by GE, a bio-pharmaceutical industry cluster led by Bayer and an automobile industry cluster led by Beijing Mercedes have also been established. Yanqing Park, a sub-organization of Zhongguancun Science Park, was founded in October 2010. Located in the northwest of Beijing the park covers an area of 4.91 square kilometers. Part of the Beijing new energy base, the park has founded a high-end service industry area with the development of high-end equipment manufacturing, general aviation and modern service industries, finance and insurance background services, and research and development training. Fangshan Park is composed of Beijing Petrochemical New Materials High-Tech Industry Base, Beijing High-end Manufactureing Industry Base, Liangxiang Economic Development Area, Beijing Haiju Foundation and Higher Education Park. It has an area of 15.73 square kilometers. (1) Beijing Petrochemical New Materials High-tech Tech Industry Base. It is one of the first 62 new industrialization demonstration bases in China. It is an important carrier of strategic cooperation between the Beijing municipal government and Sinopec and one of five industry bases under planned construction in Fangshan district. The East District focuses on fine chemistry, petrochemical new materials and crucial projects. The West District is the core area of Yanshan Petrochemical. 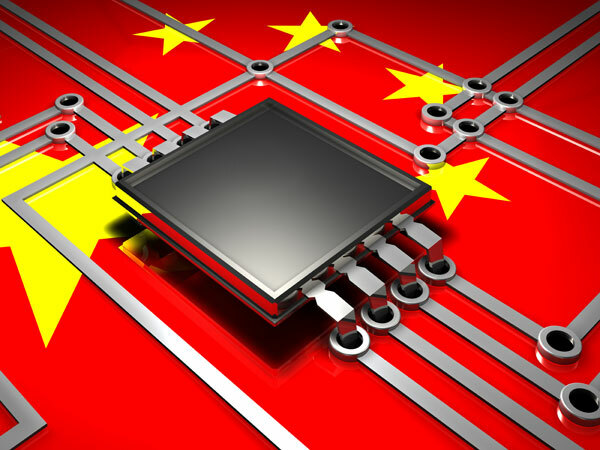 (2) Beijing High-End Manufacturing Industry Base. Changan Automobile, BWI Group, China CNR Corporation Limited, National Energy and Jinpengpa Unmanned Aerial Vehicle have settled here. Haiju Base is a new effort to adjust the industry structure in the district. It complies with the National Thousands of Talents Plan and Beijing Haiju Project and is a focal point for leaders in the city and district. Currently, there are eight projects in the base, including Beijing Feihang Jida Aviation Technology, the Environmental Protection of Xishan district project, Ntong Technology Co, Beijing Grish Co and Beijing Dongfang Xupu Technology Co. It is one of the two higher education parks approved by the Beijing municipal government. The park is divided into the college park, central landscape area, central device area and allocation area. There are six colleges and universities in the park. The construction of the graduate school of the Chinese Academy of Social Sciences, Beijing Institute of Technology, Capital Normal University, and Beijing Technology and Business University in the first stage has been completed with over 27,000 students and teachers. Plans are underway to construct Beijing University of Chinese Medicine and Beijing Vocational College of Transportation. Supply Chain Leaders: YTO Express. Founded in 2000, China`s largest and fastest growing express delivery company, YTO now employs more than 180,000 workers in 20,000 delivery centers across China. YTO delivered 14 billion packages last year. It`s services cover warehousing, distribution and special transport. In 2014 it launched it`s 90% owned subsidiary YTO Cargo Airlines which initially began operations, out of its Hangzhou hub. Shanghai Yuan Tong Express Co., Ltd. (YTO Express) is now the largest express delivery business, by market share, in China after taking advantage of the booming domestic e-commerce industry. Yu Weijiao, YTO chairman, has turned the company into a market leader in China. With 84 centers in Beijing alone and 20,000 country-wide, the group is taking advantage of the government's decision to realign the economy from cheap, mass-produced exports toward more sustainable consumer-fuelled domestic growth. In 2015 the company's revenue reached 204 billion yuan ($37.79 billion), up 42% compared to the same period in 2013, during a time of slowing economic activity, up to 19 billion yuan of which was indirectly generated by express delivery services, and that figure is expected to reach 60 billion yuan by 2020. During the 2015 Singles' Day on Nov. 11th, the company received a record-breaking 53.28 million orders across China. The group handled more than 30.59 million packages, or roughly 21 percent of the industry's total. Key to YTO's success has been expansion: from YTO's humble beginnings in 2000 when it started with a meager investment of 50,000 yuan and employed 17 staff the group now employs 180,000 staff and operates a network that covers about 93 percent of the counties across the country. In 2014, YTO delivered 2.1 billion packages, generating revenue of 24.6 billion yuan. The maximum number of parcels handled in a single day last year hit 25 million. With huge growth potential in the Express delivery sector amid strong competition from competing companies only the strongest companies are expected to survive, while smaller players are likely to link up with the leading companies such as YTO. As the State Council approved a proposal to promote the development of the express delivery sector, which will be worth 800 billion yuan by 2020, the key is to increase international competitiveness and expanded air delivery capacity facilitating the rapid rise of cross boarder e-commerce. YTO also plans to expand its air cargo operations as the company completed the maiden flight of its first aircraft in September 2014. It hopes to have a cargo fleet of 50 aircraft by 2020 and 100 in 2025. Although YTO has plans to take the company public, a timetable has yet to be announced, as the company is aiming at building a highly competitive international network first: last year, the group set up an overseas business department and the company has registered its trademark in more than 100 countries. They plan to establish about 20 overseas branches in countries including South Korea, Australia, the United States, Thailand, India, Russia and France. Designed to provide financial support for infrastructure development and regional connectivity in Asia the bank is headquartered in Beijing, China. Its first President, Mr Jin Liqun was elected in January 2016. The purpose of the Bank is twofold: to foster sustainable economic development, create wealth and improve infrastructure connectivity in Asia by investing in infrastructure and other productive sectors; and secondly promote regional cooperation and partnership in addressing development challenges by working in close collaboration with other multilateral and bilateral development institutions. 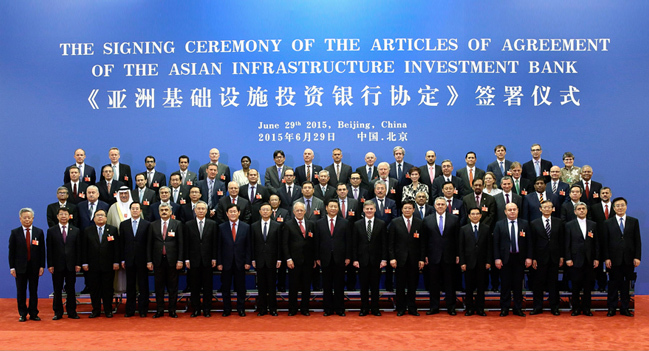 Under its Articles of Agreement, the AIIB's functions include: (i) promoting public and private investment in the Asia region for development, in particular for infrastructure and other productive sectors; (ii) utilizing the resources at its disposal for financing such development in the region; and (iii) encouraging private investment that contributes to economic development in the Asia region, in particular in infrastructure and other productive sectors, and supplementing private investment when private capital is not available on reasonable terms and conditions. As of January 2016 the founding members are: Australia, Austria, Azerbaijan, Bangladesh, Brazil, Brunei Darussalam, Cambodia, China, Denmark, Egypt, Finland, France, Georgia, Germany, Iceland, India, Indonesia, Iran, Israel, Italy, Jordan, Kazakhstan, Korea, Kuwait, Kyrgyz Republic, Lao PDR, Luxembourg, Malaysia, Maldives, Malta, Mongolia, Myanmar, Nepal, Netherlands, New Zealand, Norway, Oman, Pakistan, Philippines, Poland, Portugal, Qatar, Russia, Saudi Arabia, Singapore, South Africa, Spain, Sri Lanka, Sweden, Switzerland, Tajikistan, Thailand, Turkey, the United Arab Emirates, the United Kingdom, Uzbekistan, and Vietnam. The authorized capital stock of the AIIB will be US$100 billion, divided into 1 million shares having a par value of US$100,000 each. The original authorized capital stock will be divided into 20% paid-in shares and 80% callable shares. The basic parameter for allocation of capital stock to members is the relative share of the global economy of members (based on GDP) within the regional and non-regional groupings, with the understanding that the GDP share is indicative only for non-regional members. What are AIIB's key financial instruments? The AIIB will focus principally on financing specific projects or specific investment programs, equity investments; and guarantees. It may: (i) make, co-finance or participate in direct loans; (ii) invest in the equity capital of an institution or enterprise; (iii) guarantee loans for economic development; (iv) deploy Special Funds resources in accordance with the agreements determining their use; or (vi) provide other types of financing as may be determined by the Board of Governors. Special Funds would be donor funds that are given to the Bank for use consistent with its purpose and functions. In addition to the capital subscribed by members, the AIIB will raise funds primarily through the issuance of bonds in financial markets as well as through the inter-bank market transactions and other financial instruments. The AIIB may raise funds, through borrowing or other means, in member countries or elsewhere, in accordance with relevant legal provisions. Hainan Airlines is the fourth largest carrier in China in terms of fleet size. However, it is the only airline based in the People’s Republic to earn a five star rating from Skytrax (not counting Hong Kong’s Cathay Pacific). Much of Hainan’s service is focused on its namesake island, which is becoming a major tourist destination for both domestic and international travelers. In addition to its main base in Hainan’s provincial capital, Haikou, the carrier has a hub in Beijing and a number of focus cities around China (including in economic hotspots like Chongqing and Shanghai). Now, the upstart airline is trying to take its five-star reputation to the bank by continuing to expand its international route offerings. The carrier plans to launch service to both Tel Aviv and Manchester, England starting next year. Hainan has adopted a strategy that has become rather popular amongst up-and-coming airlines. In Manchester, they have found a market that has yet to be tapped. London residents already have nonstop connections to Beijing, but Manchester does not yet have such a service. Hainan’s goal is to create a new “air bridge” between Northern England and China. This kind of service is often appreciated by people in “secondary” cities because it means they do not have to travel to another hub in order to fly overseas. This is not the first long-haul route that the airline has added to Hainan’s map. In fact, the Manchester service, slated for takeoff in June of 2016, will be the sixth major transcontinental route launched in recent times. The airline’s Beijing-San Jose flight is another example of trying to develop service in a new, underserved marketplace. Today, most transpacific flights take off from SFO, requiring a train or taxi trip north for travelers from San Jose and other parts of the Southern Bay Area. Hainan Airline’s other new long-haul routes are Chongqing-Rome, Shanghai-Boston, Shanghai-Seattle and Beijing-Prague. According to the carrier, more intercontinental flights are in the works. Hainan is banking on its image as a premium airline to differentiate itself from others in the crowded Chinese marketplace. They claim to have better food, better service and more spacious seating than the competition. These claims are backed up to a certain extent by the Skytrax rating, which is based on flier survey results. Billing itself as a premium airline has always worked quite well for one of Hainan’s main competitors, Cathay Pacific. Hainan has also become a major player on the domestic front. It has snapped up or launched a number of regional carriers including business-oriented Beijing Capital Airlines, Fuzhou Airlines and Kunming-based Lucky Air. They are also a minority stakeholder in Hong Kong Airlines. Hainan Airlines is obviously focused on leaving its niche behind and becoming one of the major players in China’s long-haul and domestic marketplaces. The strategy of expanding into underserved destinations like Manchester could work in the airline’s favor. At the very least, it is a welcome trend both for Chinese travelers (and East Asian fans of Manchester’s two popular soccer franchises) and for English fliers who are heading to China and don’t want to have to connect through London or another European hub. The business of selling airline tickets and resort vacations to China's holiday-happy middle class is now a battleground for Internet giants, following a deal that brings Ctrip.com International Ltd. to the fore. Ctrip was already the country's biggest online travel agency before announcing a share-swap agreement on October 27th that gave it virtual control of traveler services provider Qunar Cayman Islands Ltd., a subsidiary of the Internet search giant Baidu Inc. In the deal, Baidu transferred 45 percent of its stake in Qunar to Ctrip. In turn, Baidu got a 25 percent stake in Ctrip. The swap strengthened Ctrip's grip on what market research institution iResearch says is China's 270 billion yuan online travel agency market. Ctrip already owns 37 percent of eLong Inc. and 6 percent of Tuniu Corp. The tie-up of the two Nasdaq-listed companies with a combined market value of US$ 18 billion set the stage for a three-way travel market battle pitting Baidu and its new partner Ctrip against the nation's dominant social media company Tencent Holdings Ltd. as well as e-commerce leader Alibaba Group. Tencent has an online travel information section on its qq.com platform, an instant messenger. The company has also invested US$ 84 million in travel service provider eLong in 2011 and US$ 78 million in LY.com in 2014. Alibaba, meanwhile, has had one foot in the travel agency door since 2010 by selling ticket and hotel booking services through its Tmall and Taobao websites. It's also invested millions of U.S. dollars in several online travel sites including qyer.com and baicheng.com. And in October 2014, Alibaba formally launched its own travel service division called Alitrip. But through their new partnership, Ctrip and Qunar now account for nearly 70 percent of all revenues generated through the country's online travel market. Alitrip's is pitching it`s service as an open platform through which travelers and qualified service providers can find each other. Future plans call for offering various traveler conveniences, such as hotel room deposit waivers based on a client's credit record with Alibaba. In its first year of operations the company signed up more than 100 million members and averaged more than 10 million daily webpage views. But it's still lags behind Ctrip and Qunar. And although big brands rule the market, a number of new players have recently joined the online travel services game. One is the group-buying website company Meituan.com, which for the second half of this year reported 5.3 billion yuan worth of hotel bookings as well as 1.8 billion yuan worth of other travel-related deals. Meituan established a new division in July aimed at expanding its services. China is also seeing traditional, storefront-based travel agencies increasing their online exposure opportunities through a growing number of new websites. Nevertheless, the country's online travel giants have fortified their market positions in ways that should keep their new rivals at bay for a long time. For several years the market had anticipated a Ctrip-Qunar merger. The main focus of the merger is as a way to streamline business and counteract competitive pressure since many domestic companies in this industry are running in the red. For the second quarter, Qunar reported an 816 million yuan loss. Elong.com registered a 356 million yuan loss and Tuniu said it lost 292 million yuan in the same period. Ctrip outperformed its rivals by posting a 143 million yuan net profit for the second quarter, a 5.9 percent increase from the same period last year. Baidu, meanwhile, has been singled out by market analysts as the biggest winner in the deal between Ctrip and Qunar. The search engine had controlled Qunar since buying a 62 percent stake for US$ 306 million in July 2011, just a few months after expanding into what was then a fledgling market for online travel services. Ctrip and Qunar will likely continue to operate separately yet complement one another. Ctrip will focus on the business traveler, hotel and ticketing operations, while Qunar will function mainly as a platform for a variety of travel services based on packages, search and price comparisons. But the merger also presents challenges for the companies involved. Baidu, for example, must figure out how to integrate and distribute traffic and resources between Ctrip and Qunar. In the short term Ctrip and other travel booking sites are expected to continue relying on investments to keep their businesses growing whilst being forced by the competitive environment to offer services at discounted rates.